Cautious conciliatory overtures between Riyadh and Tehran indicate that the realities of the regional power balance might outweigh long-standing hostilities and differences on political and religious ideologies. One of the main policy agendas of Iran’s president Rouhani’s government is ‘constructive engagement’ with all six member states of the Gulf Cooperation Council. Iranian foreign minister Javad Zarif visited Qatar, Kuwait, Oman and the UAE. President Rouhani’s visit to Oman resulted in a historic gas pipeline agreement between the two states. Despite Rouhani’s calls for a thaw in Riyadh-Tehran relations, Saudi Arabia, with Bahrain following suit, have resisted Iran’s diplomatic overtures, until now. Relations between Saudi Arabia and Iran took a landmark turn when Riyadh extended an invitation to Tehran’s foreign minister Mohammed Javad Zarif. Saudi foreign minister prince Saud Al Faisal conveyed Riyadh’s readiness to negotiate with Iran and resolve differences between the two Gulf states. This declaration came just short of another round of nuclear negotiations between Iran and P5+1 in Vienna. Let us look at Saudi-Iran relations leading up to this development, within the framework of the evolving regional security architecture. This is not the first time the US has referred to Iranian involvement in some of the deadlocked conflicts in the region. Secretary Hagel has admitted that the nuclear deal with Iran does not mean “the threat from Iran is over.” Interestingly, Iran and Saudi Arabia are on opposing sides over the restive situation in Lebanon, Syria and Iraq. These conflicting policies are broadly ascribed to the fast-increasing crystallisation of Shia-Sunni polarisations. However, it can be argued that balance-of-power considerations and domestic dynamics are also critical drivers behind regional policies that inform the current security architecture. Iran and Saudi Arabia developed a mutually beneficial alliance prior to the Iranian revolution of 1979. In an effort to contain the threat from the Ba’athist regime in Iraq, the People’s Democratic Republic of Yemen, and to consequentially counter the spread of Soviet influence, both states developed cordial relations. However, the Iranian revolution unravelled this relationship and Tehran came to be perceived as an exporter of revolutionary religious extremism and a threat to the Gulf monarchies’ regime security. The Gulf Cooperation Council was institutionalised against the backdrop of the Iran-Iraq war and the relationship further deteriorated with the “tanker war” and Iran’s boycott of Hajj pilgrimages to Mecca. During president Rafsanjani’s tenure (1989-1997) an outreach to Riyadh was initiated after fifteen years of strained relations. Iran ended the boycott of the Hajj pilgrimage and official visits followed including a visit by president Rafsanjani to Riyadh in 1997. Iran was always opposed to foreign military presence and advocated the establishment of regional security co-operation. This effort, first advocated by the Shah of Iran, was championed by President Rafsanjani in the 1990s. Rafsanjani’s efforts to develop better relations in the Gulf led to a degree of support for a regional security arrangement, particularly from Oman. However, eventually the GCC States preferred bilateral security agreements with the west. In an effort to improve relations, Iran also maintained neutrality in the conflict between Iraq and the allied forces led by the US over the invasion in Kuwait. Relations between the two states improved during former Iranian president Khatami’s tenure, supported in this initiative by his Saudi counterpart King Abdullah. He visited Saudi Arabia, Bahrain and Qatar in 1999. Iran and Saudi Arabia signed a historic security agreement in 2001 for cooperation against terrorism, money laundering, drug smuggling etc. However, president Ahmedinejad’s rhetorical diatribes pointed towards an ideological component in Iran’s foreign policy and reversed the nature of relations between Tehran and Riyadh. The strain in relations was further exacerbated by heightened concerns over Iran’s clandestine nuclear programme. Saudi Arabia’s support for the US military presence in the region heightened Iran’s fear of a military attack against its nuclear facilities. Even though Iran and Saudi Arabia are engaged in ‘proxy-wars’ in Syria, Lebanon and Yemen, president Rouhani began his tenure with an agenda of mending relations with the Gulf States, particularly Saudi Arabia. Former president Hashemi Rafsanjani supported president Rouhani in this endeavour, stressing the need to expand bilateral ties and devise a framework for cooperation. President Rouhani has faced criticism for his conciliatory stance from the Islamic Revolutionary Guard Corps, Iran’s most powerful military force. The IRGC is economically entrenched in the building of nuclear facilities and the petrochemical industry to name a few. They are believed to be the guardians of the legacy of the Islamic Revolution and made up more than half of President Ahmadinejad’s cabinet. Ayatollah Khamenei cultivated the IRGC into a powerful political and economic group accountable only to him. Analysts like Mehdi Khalaji assert that the IRGC’s control over socio-cultural facets of Iranian society is designed to promote the Ayatollah’s agenda. However, President Rouhani’s efforts to curb the political power of the IRGC have the supreme leader’s endorsement. In a meeting with IRGC Commanders, the Ayatollah stated that “The IRGC is the guardian of the Islamic Revolution. I do not want to suggest that ‘guardian’ means the IRGC should be the guardian in all fields: scientific, intellectual, cultural, economic.” Responding to criticism from the opponents of the nuclear talks, president Rouhani alluded to support from the supreme leader to proceed with the negotiations. Iranian domestic dynamics are therefore informed by two critical elements. One is the policy outlook of the president and the supreme leader; second is the relationship between the supreme leader and the president. This relationship defines the translation of competing narratives of ideology and pragmatism in Iranian foreign policy. This political factionalism is endemic to Iran’s revolutionary character, the institutional features of its constitution (velayat e-faqih) and its regional environment. Regional hostilities, military conflicts and increased western military presence have been critical features in shaping Iran’s security and policy calculations. US military presence in the Gulf, Iran’s dispute with the UAE over the sovereignty of the Abu Musa Islands, the conflicts in Iraq and Afghanistan and Israel’s nuclear programme formed the foundation of its diplomacy and foreign policy. Saudi Arabia’s regional policy is driven by its goal of regime security, which faces a regional and domestic threat. On the regional front, Saudi Arabia faces a threat to its hegemony from other military powers. On the domestic front, Riyadh faces a threat to its political stability from ideological influences and movements. Iran’s Islamic revolution was symbolic of the possibility of political change wherein the Ayatollah condemned monarchies as “contrary to Islam”. Saudi Arabia has always feared Iran’s ability to export the revolution to its borders, particularly by inciting the Saudi Shia community. Each of the GCC States has strains in their bilateral relationships with Saudi Arabia and has asserted independence from Riyadh at different points in time. However, the commonly perceived threat from Iran, regionally and domestically, facilitated Saudi Arabia’s institutionalisation as the leader of the GCC in 1981 – by virtue of its size and wealth. Saudi Arabia has also attempted to assert dominance in the domestic politics of Iraq, Lebanon, Syria, Palestine and Yemen. As Iranian influence spread with the fall of Saddam Hussain in Iraq, Hezbollah’s victories in Lebanon and president Assad’s resilience in Syria for instance, Saudis have made efforts to balance the rise in Iranian power by supporting opposing factions in each of these countries. Gregory Gause III argues that Saudi Arabia is more likely to balance against an ideological threat than a military threat because an ideological threat poses a greater danger to its regime security. Hence it supported Iraq over Iran in 1980 even though Iraq was a regional military power at the time. Similarly, relations between Saudi Arabia and Iran improved in the 1990s despite Iran’s status as the region’s largest military power because it had scaled back its hostile revolutionary rhetoric. Even as the ‘Arab Spring’ confrontations develop a sectarian character, the Saudi-Iranian relationship cannot be perceived through the dichotomous lens of sectarianism or of pragmatism. The evolving relationship between the two states incorporates both elements. 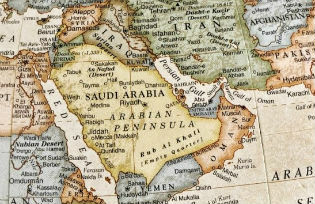 While Saudi Arabia has always preferred an external balancer against Iran, increasing speculation about western disengagement from the region has presented Saudi Arabia with two choices – either intensify its confrontational stance against Iran or follow an ‘accommodationist’ approach. A shift in Washington’s approach to the nuclear stand-off with Iran, and the smaller GCC states’ positive reception of Iran’s efforts towards ‘constructive engagement,’ are likely to have caused a shift in Riyadh’s posture towards Tehran. Riyadh is continuing to balance Iran through conventional weapons’ build-up and efforts towards a greater GCC union. Iran’s efforts to come out of isolation following the crippling effects of sanctions, however, have also been compounded by the disunity between the GCC States. While the two states differ on political and religious ideologies, the main driver of their relationship is an effort to shape the regional balance of power. Each of the states’ influence in the domestic politics of weak states in the region, like Iraq, Lebanon and Syria is formed along the Shia-Sunni divide. This politicisation of sectarian identities has been used by both states to establish their regional pre-eminence. However, the current regional security architecture necessitates a recognition of realities and hence, a move towards resolution of differences between the both of them. Kanchi Gupta is a Junior Fellow at the Observer Research Foundation, New Delhi, India. She leads the West Asia Programme at ORF.